In 1795, when President Washington sat for Charles Willson Peale (q.v. ), the artist's young son Rembrandt was allowed to paint his own portrait of the statesman. Thirty years later Rembrandt Peale returned to the subject, producing a series of idealized paintings and prints calculated to appeal to a nationalist cult fascinated by the heroic myth surrounding Washington. 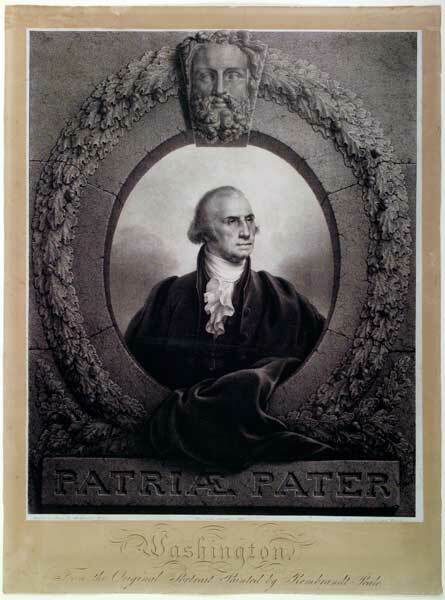 This lithograph, the most famous of the images, combined the painter's own recollections with elements from famed portraits by his father and by Gilbert Stuart. One of the first American artists to use lithography, Peale drew his original portrait directly on the printing surface. The image was then printed by William S. and John B. Pendleton, Peale's former students, who ran one of America's most important early lithographic workshops in Boston. Such prints disseminated Peale's art to a broad audience, helping to publicize his paintings and increase his reputation. In this version of the famous portrait, the illusionistic stonework was decorated with a carved keystone representing the mask of Zeus, supreme ruler of the ancient gods. The stonework also includes a garland of oak leaves, Zeus's symbol, and the carved legend PATRIAE PATER (father of the country). Thus, physically and symbolically isolated from the everyday world, Washington was presented more as a deified hero than a historical personage.